IQD’s new IQXT-205 series of Temperature Compensated Crystal Oscillator (TCXO) and Voltage Controlled Temperature Compensated Crystal Oscillator (VCTCXO) is housed in a miniature 2.0 x 1.6 x 0.7mm hermetically sealed ceramic package and the series is available in three different options IQXT-205-1, IQXT-205-2 and IQXT-205-3. All three options are available with a frequency range of between 13MHz and 52MHz and in five different voltages; 1.8, 2.5, 2.8, 3.0 & 3.3V. The IQXT-205 has a Clipped Sinewave output and 10kΩ//10pF load with a current draw of 2.0mA maximum and a phase noise of -135dBc/Hz @1kHz. 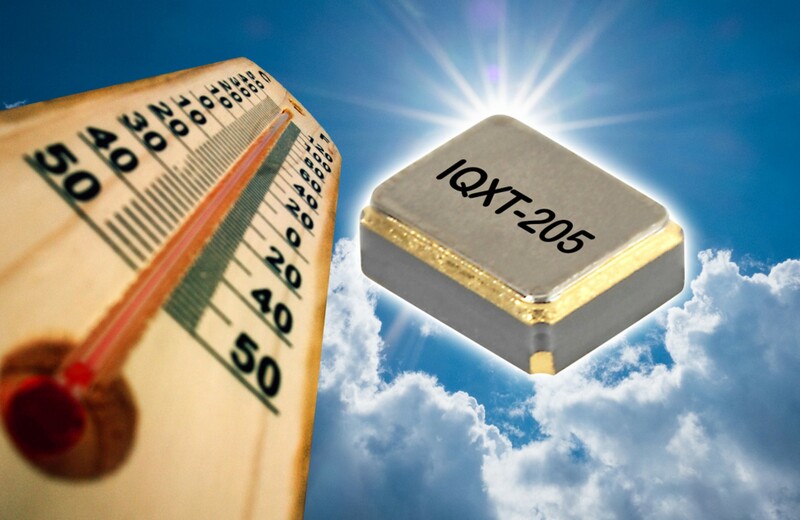 The IQXT-205-3 series, a Temperature Compensated Crystal Oscillator (TCXO), has a frequency stability of ±0.5ppm over a wide operating temperature range of -40 to 105 degrees C and available in six frequencies; 16.3690MHz, 19.20MHz, 26.0MHz, 33.60MHz, 38.40MHz and 52.0MHz. The IQXT-205-2 series is a Voltage Controlled Temperature Compensated Crystal Oscillator (VCTCXO) and IQXT-205-1 is a Temperature Compensated Crystal Oscillator (TCXO) and both have a frequency stability of ±0.5ppm over an industrial operating temperature range of -40 to 85 degrees C with the VCTCXO having a pulling capability of between ±8ppm min to ±13ppm min. The TCXO & VCTCXO are both available in eighteen frequencies; 16.20MHz, 16.3680MHz, 16.3690MHz, 19.20MHz, 20.0MHz, 24.0MHz, 25.0MHz, 26.0MHz, 27.4560MHz, 28.9250MHz, 28.9740MHz, 30.0MHz, 32.0MHz, 33.60MHz, 38.40MHz, 48.0MHz, 50.0MHz and 52.0MHz. The IQXT-205 series is ideal for 4G/LTE, Bluetooth, Ethernet, GPS, Internet Of Things (IoT) and Wi-Fi applications. Packaging options are ‘Tape and Reel’ or ‘Cut Tape’ and a range of IQXT-205-3 are available either direct from IQD or via its extensive range of worldwide distributors. Further details are available on IQD’s website at www.iqdfrequencyproducts.com or for further advice, speak to a member of our Applications Support Team.